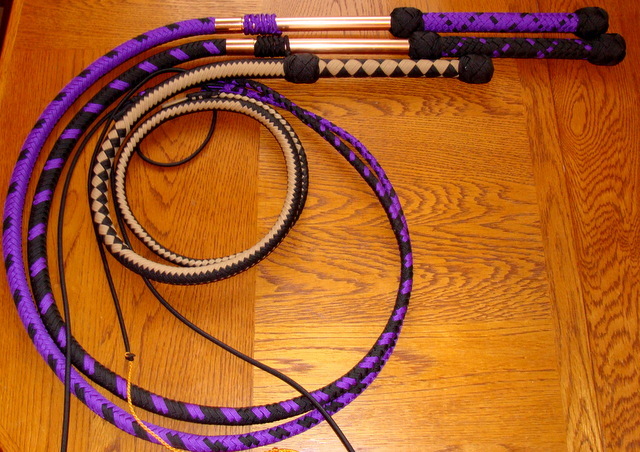 Show whip, pipe whip, cow whip, stock whip, cane whip, performance whip...... Lots of names for the same kind of whip. 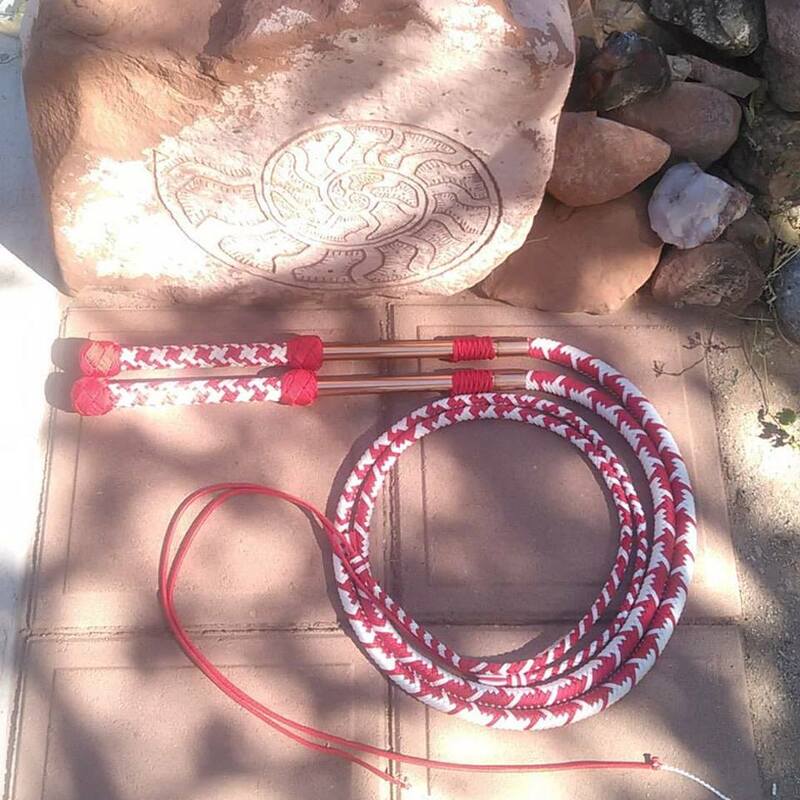 My Show whips are made from 550 paracord and attached to a 16 inch copper or stainless steel handle. The thong is 12 plait with one belly and the handle is 16 plait. They are very light and fast. The leverage created by the longer handle makes cracking these whips a breeze. 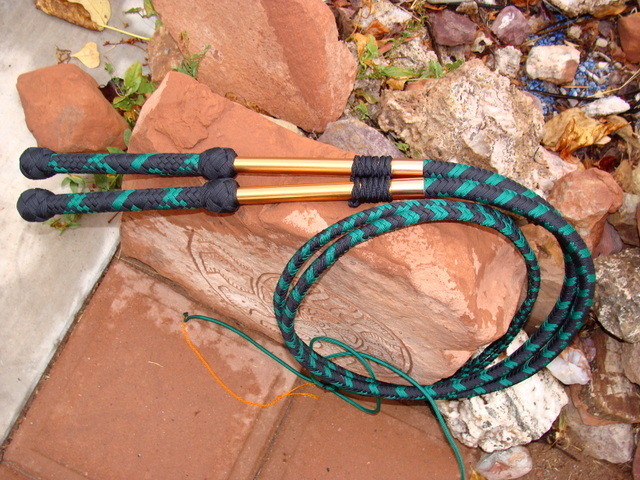 Most of the whips made in this style have a handle made of PVC pipe. I wanted to do something a bit different and a little more pretty. That is why I went with the copper. Each one is polished to a high shine and then dipped two different times in polyurethane to prevent oxidation and to preserve the shine. Some people have been worried that the metal will make it too heavy. My show whips weigh only 11 ounces totally assembled. That is exactly 1.5 ounces heavier than the ones I used to make with PVC. I was really happy that they turned out almost the same. Show whips are perfect for the beginner as well as the more experienced cracker. They are by far the most fun to volley and to do fast routines with. A lovely, accurate and well deserved review for a tool that is also a work of art. Brava. Robby's right, your work and attention to detail deserves a higher price tag. You give true value and lasting quality to your customer's investment. Thank you Bobbi, for creating whips that I love to crack, they are perfectly suited to my De Longis 'rolling loop' style of minimum effort for maximum efficiency. I prize my own Holyoak whip hybrids that you've created for me and you can rest assured I will be a life long customer. 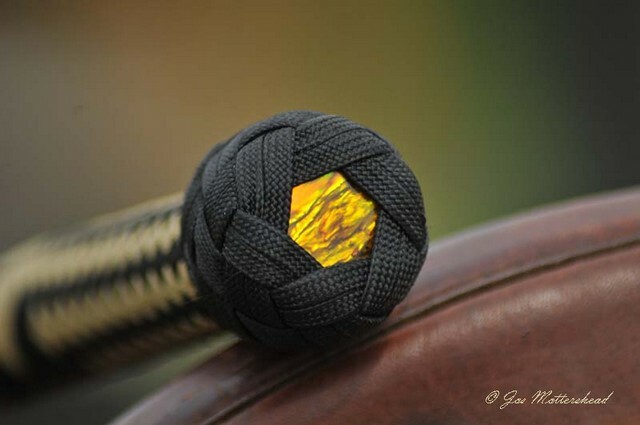 I will be recommending your work to anyone wanting a high quality, aesthetically pleasing and pin-point accurate whip. Thanks, Robby for a terrific assessment.